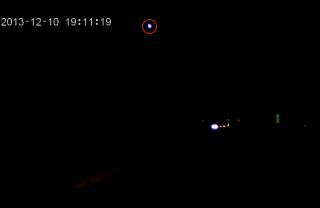 The Arizona meteor (circled at upper left) streaks above a car's dashcam. Image uploaded Dec. 11, 2013. The Geminid meteor shower — one of the most spectacular meteor displays of the year — may hit its peak this weekend, but some stargazers in Arizona got a sneak preview of the celestial light show Tuesday night (Dec. 10). A meteor exploded over Arizona, rattling windows and producing at least one loud boom, according to press reports, but the meteor explosion itself was not part of the Geminid meteor shower, a meteor expert says. The Geminid meteor shower — so named for it radiant point in the constellation Gemini — is set to peak in the overnight hours from Dec. 13 to 14. At its height, skywatchers in dark areas should be able to see anywhere from 90 to 120 meteors per hour, weather permitting, according to some forecasts. Observers will have the best chance to see the so-called "shooting stars" after 4 a.m. local time when the waxing moon sets. Under usual circumstances, it's better to catch the Geminids a little after midnight local time, however, this year, the moon could get in the way, making the 4 a.m. hour a better bet. Geminid meteors can be slow and bright with a yellowish hue, but sometimes the shower produces bright fireballs. "The best thing to do to observe meteors is to lie flat on your back and look straight up," Cooke said. "You don't want to look at Gemini, you just want to look straight up and take in as much of the sky as possible because meteors can appear anywhere in the sky and the more sky you see, the better you chance of seeing a meteor." The Geminids are created each year when Earth passes through dust left behind by the asteroid 3200 Phaethon. The shower was first documented in the 1800s when there were only 10 to 20 meteors per hour at peak, however, the intensity of the shower has increased over the years.